1. In large skillet, heat oil and cook chopped onion for about 5 minutes, or until very soft. Stir in minced garlic and cook for about half a minute. Add ground beef and cook, breaking up the meat, until it is well browned. With extra lean ground beef, there will be no excess fat to drain off. Stir in the tomato paste, cooking for a few minutes to “toast” it. Stir in remaining sauce ingredients. Bring to a simmer. Simmer, loosely covered, for about 30 minutes. Remove the bay leaf. Taste and adjust seasoning. Let cool at room temperature for 30 minutes, then cover and refrigerate for at least one, or up to several, hours. 2. In large pot, bring 4 quarts of salted water to a boil. Cook pasta according to package directions. Drain and rinse in cold water. I leave the noodles in a bowl of cold water as I’m assembling the dish. 3. In 1-quart bowl, combine ricotta, Parmesan, egg, parsley, nutmeg and milk. The milk is just to give the filling a spreadable consistency so you have even layers of filling instead of big blobs. 4. Lightly oil a 13-by-9-by-2-inch baking dish. Spread 1/4 cup or so of sauce over the bottom of the dish. 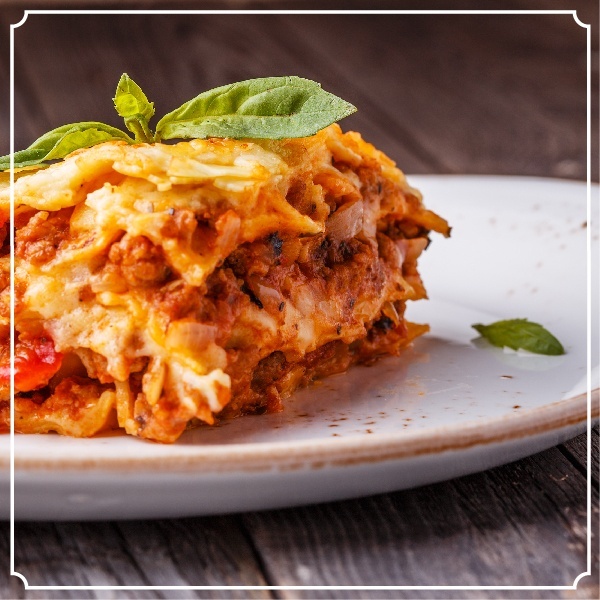 Lay on a layer of lasagne, the number of noodles will vary with different brands. With my favorite brand, Bionaturae organic whole wheat lasagne, 4 noodles laid widthwise cover the pan. Spread with 1/3 of the cheese filling, 1/4 of the shredded mozzarella, then with 1/4 of the sauce. Repeat twice for three layers. Add a fourth layer of lasagne. Cover the top layer with the remaining 1/4 of sauce and mozzarella. Cover with plastic wrap and refrigerate until an hour before serving time. 5. Preheat oven to 375°F. Bake at 375°F for about 45 minutes, or until crusty and bubbly. Let stand for 20 minutes before slicing and serving. I’ve made different lasagna recipes before. This one looks pretty good and I’m going to try it and I will take a picture and show you the results. Thank you very much for sharing your recipe. Your castle is outstanding! I plan to visit next year with my bride.